This paper is the latest data release of the Kepler Mission. The catalog introduces 1091 new planet candidates, bringing the total number of Kepler planet candidates to 2,321. You can read the press release and browse the table of candidates in the Exoplanet Archive. These new planets are, on average, smaller and colder than the planets yet discovered, indicating that Kepler is on the verge of detecting true Earth-size planets in the habitable zone. You can see this for yourself in the figure below, which color-codes the Kepler planet candidates by the date of their catalog release. The later catalogs show increased discoveries of smaller planets and planets at longer orbital periods. More than 2,300 Kepler planet candidates have been discovered to date. This plot shows planet candidates as a function of planet radius (y-axis) and orbital period (x-axis). Horizontal lines demarcate the radii of Earth, Neptune and Jupiter for easy comparison. 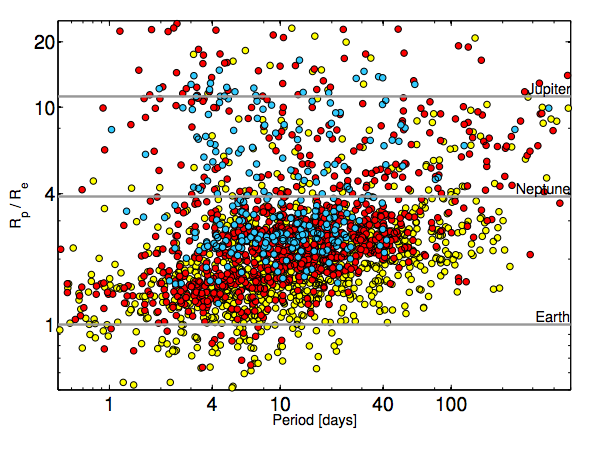 The blue points correspond to planets from the June 2010 data release, red are from the Feb. 2011 release, and yellow are this release (Feb. 2012). From Batalha et al. But how close is Kepler to finding Earth-size planets at periods of one year, or Earth analogs? 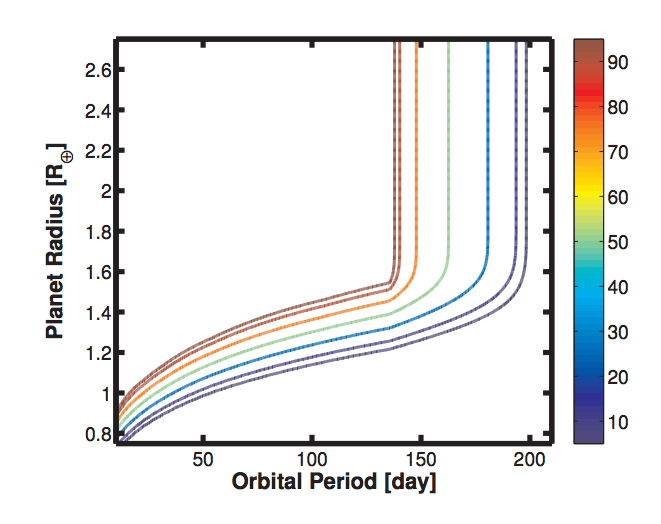 The figure below shows how “complete” Kepler is, or what fraction of the discoverable planets it has already discovered, as a function of planet size and orbital period. For instance, Kepler has discovered 90% of the 1.6 Earth-radius planets with orbital periods of 130 days, but fewer than 10% of planets that size with 200-day orbits. Earth analogs, with an orbital period of 365 days, are beyond the right side of this plot and are basically 0% complete. If granted, an extended mission will allow the Kepler team to increase the discovery completeness of small planets and of planets at long orbital periods. Completeness of planet discovery for the Kepler Mission. Each contour corresponds to the completeness indicated in the color-bar on the right. From Batalha et al. Another way to think about the completeness statistic is to ask the question, “How many more planets with these parameters do we expect to find?” Since the Feb. 2011 data release, the number of planets smaller than 2 Earth radii has increased by 197% – or tripled – and the number of planets with orbital periods larger than 50 days has increased by 123%, or more-than doubled. While the completeness for planets in this regime remains low, we can expect similar growth in the numbers of these planets for years to come. Although Kepler has not found an Earth analog, it has found many planet candidates in the habitable zone. 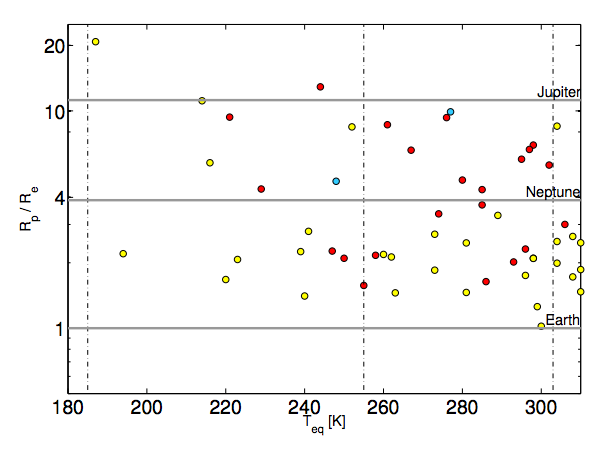 The figure below shows the planets in the habitable zone that Kepler has found to date. Kepler planet candidates in the habitable zone. This plot shows the planet radius compared to Earth vs. planet equilibrium temperature. Horizontal solid lines demarcating the radii of Earth, Neptune and Jupiter are shown. Vertical dashed lines mark the lower and upper boundaries of the habitable zone (left and right), as well as Earth's equilibrium temperature (center). From Batalha et al. Each of these planets in the habitable zone is a discovery worth celebrating. If Kepler is granted an extended mission, we should (statistically speaking) have many more such planets to celebrate, including many that are rocky like Earth. I hope they have elephants too. Elephants are nice. Excellent! Now when we see some horrible story about the latest first-world problems, we actually will have a list of habitable planets we can plan to leave earth for! Unfortunately, the Kepler planets are hundreds to thousands of light years away, so they are not ideal destination for interstellar travel. However, the sheer number of planets Kepler has discovered, especially small planets in the habitable zone, indicates that such planets probably exist around stars much closer to home. The next generation of exoplanet searches will target nearby stars (stars within 100 light years of Earth). Hopefully we will find some nearby habitable planets soon! Great work Kepler, keep sharpening that Drake equation.